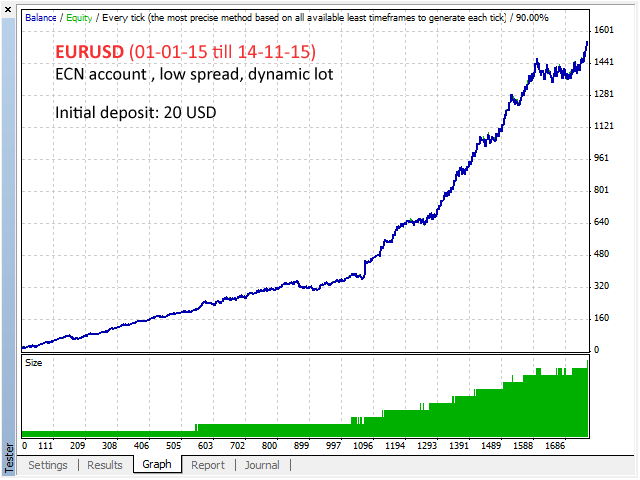 This automated Expert Advisor is designed to work with ECN brokers and low spreads. The EA works around the clock and there is no need to stop it during during important news releases. Trade is conducted by the levels. The EA features the search for the necessary levels at once on two time periods. The EA uses the built-in filter to select levels, at which it will place the pending orders. All orders are opened with the predefined StopLoss and TakeProfit parameters. Thus, even in the time of big change in the market price, your deposit is protected from large losses. After activation of a pending order, the EA additionally launches virtual StopLoss and TakeProfit orders that can close a deal earlier. Periodically, pending orders are deleted. If the levels are still relevant, the EA will open pending orders again. The EA has the spread filter. If the spread is greater than the set value, then all pending orders will be deleted. Over time, the orders will be restored. The EA is optimized for EURUSD by default. The period of the chart, on which the EA is running does not matter and does not affect its operation. 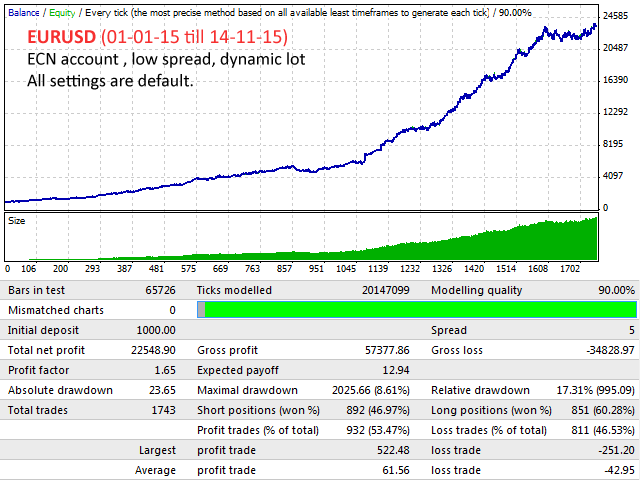 After installation, please set a risk parameter or a fixed lot, depending on your trading style. Recommended minimum deposit is 20 USD on a standard account or 10 USD on a cent account. Magic Number - unique number of the Expert Advisor's orders (any numbers). If you have any questions, please send me a private message. I will be glad to help you. The EA has been optimized and the new parameters are set by default. Changed the algorithm for determining the levels at which pending orders are placed. Added ability to delete pending orders on Friday before the market closes. Improved "Trade Mode 1" in the Expert Advisor.